It has been a few years, maybe more than a few, since I have really focused on fishing the McKenzie. The old memory banks are full to the brim, however, with wonderful days spent fishing the Mack from Bellinger clear down into the Willamette. Never fished the full distance on one day, mind you. We took shorter daily floats to focus on different hatch conditions and fish different river levels. Some days were magic and the wild cutts and/or rainbow cooperated, even in what I considered “muddy” water downstream from the Mohawk. Some days were crazy making, with bugs popping out and trout going crazy with no love whatsoever for our best flies of the time. Speaking of the Mohawk, ODFW has run downstream-migrant fish traps there for several years. Turns out that the Mohawk is birthing place and nursery for many, perhaps tens of thousands of wild cutthroat. The importance of the Mohawk to the wild cutthroat in the lower McKenzie and Willamette can not be overstated. As far as we know, or suspect, or guess from ODFW’s observations, McKenzie rainbow tend strongly to be mainstem spawners, but the Cutthroat seem strongly dependent on tributary spawning and early life rearing, before an almost smolt-like migration to the larger waters of the McKenzie and Willamette. This time of year, fishing the McKenzie below the Mohawk, I remember catching wild cutts in the 9″ size range, fish that were fat and silvery. I also remember catching cutts of that size and larger, fish that were very heavily spotted and very slim. The former fish were first-time downstream migrants, probably, and sexually immature. The slim cutts were post-spawning fish, moving down from the Mohawk where they probably over-wintered, to the mainstem grocery store to bulk up during spring and summer. McKenzie Rainbow caught at this time of the year include fat shiny immature males and females; fat (really bulging fat) females that are ripe with eggs and almost ready to spawn; females that are partially spawned; and sexually mature males that are brick red and all hook jawed. When the water is clear enough, one can see the small redds of the rainbow around gravel bars, especially around any of the few remaining river braids and islands in the lower river. As important as the Mohawk is to the wild cutthroat, these channel braids and islands are crucially important to the health of the wild Rainbow. No braids, no islands, and the wild rainbow population will be seriously compromised. Adding rip-rap and channelizing the McKenzie is like poison to these wild rainbow. The Renegade was one of my favorite flies to fish during the times when trout were hungry and not particularly selective. Fished upstream on a dead drift, fished down and across on the swing, or fished straight blow the boat, with a twitch now and then, were all effective at different times throughout the day. People laughed at me for my stash of renegades, but they laughed at me for more reasons than I could count, so ……. 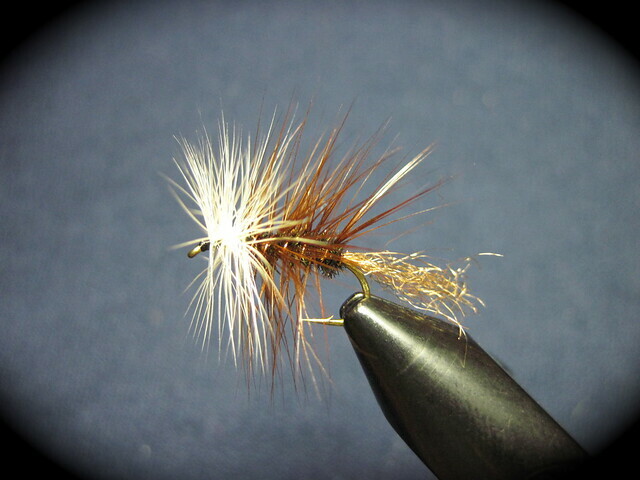 Anyway, Chris asked me to dig out some of my old favorites in the March Brown type of fly to shoot videos. We are always looking for opportunities to keep people excited about fly tying, and along the way, tell a few fishing stories and demonstrate fundamental fly tying methods. This fly is dressed up with the addition of the trailing shuck which I never was innovative enough to use back in the days. Unlike the fore-and-aft hackled Renegade, this version is one that I used because it was simpler for me to tie by palmering the peacock body like I would have with an EHC (Elk Hair Caddis). Frankly, there were days when a store-bought renegade, slightly more sparsely hackled, was better received than my fly, so I carried some of them too. This fly, sans nymphal case, was a great dry fly fished in the Metolius above Wizard Falls in June (size 12) and in September (sparse size 18). The Metolius rainbow demanded a perfect dead drift, and only RARELY accepted a down and across swing with this fly. Laugh all you will, but the Renegade or/and this version of the fly, remain among the traditional patterns that merit consideration next time you are poking around your fly vest for something to tie on the end of your leader. This is also a good caddis pattern too, just use grizzly in place of the white hackle and omit the tail, I call it a “McRenegade”.